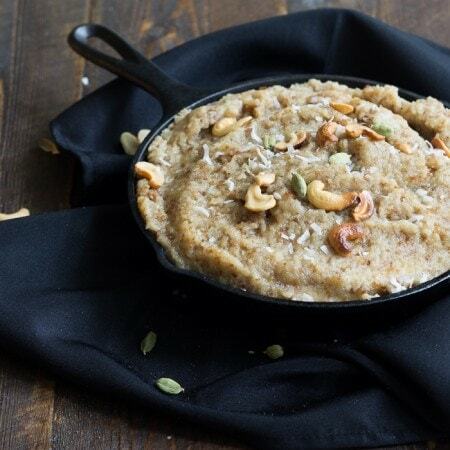 You see, their bread halwa might just be one of our favorite desserts, ever, but they only make it occasionally. And when they do… it’s every man for himself. Our eyes are approximately 14 times bigger than our stomaches, so we load up our plates with the stuff–their version being positively drenched in ghee and totally covered in sugar–and groan a couple bites in. Bread, sugar, ghee, cardamom – doesn’t sound like it’ll take you out, does it? But oh man, that stuff can put you in a food coma for an afternoon! That’s why, when the über-talented Meriem of Culinary Couture asked me to partake in her virtual Eid party, I knew I had to take on bread halwa, veganize it, and lighten it up a bit! For those of you who don’t know, Eid marks the end of Ramadan, which is the month during which Muslims fast from sunrise to sunset. As you might imagine, after a month of fasting during the day, Eid is full of fun and rich desserts! Though O and I aren’t necessarily Muslim, most of his family is. I’m fascinated by the culture of his father’s side of the family, as you might have seen by the touch of mendhi in our wedding photos! 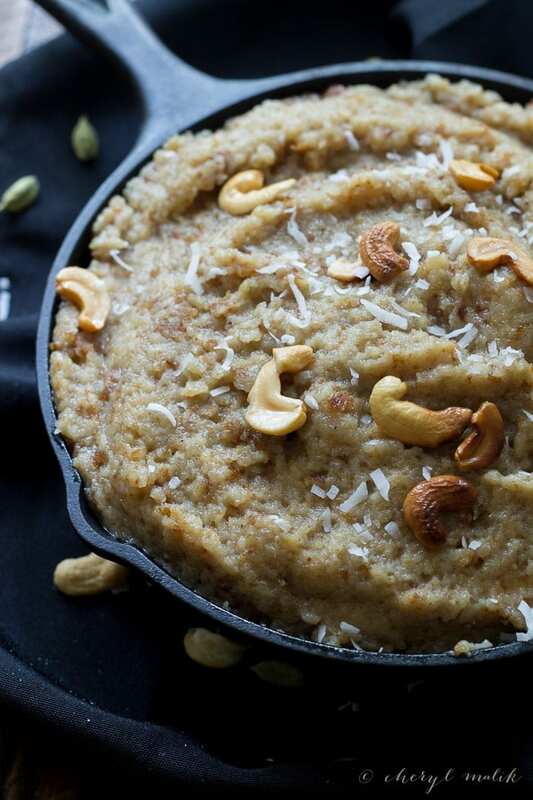 Whether you’re celebrating Eid or not, though, you should definitely celebrate something and make this vegan bread halwa! It’s an awesome way to use up a getting-stale loaf of bread, and you most likely have everything you need on hand, especially if you’re vegan (what, you don’t have a gallon of coconut oil in your pantry? ). It comes together pretty quickly and is simultaneously sweet and nutty, spiced and floral, satisfying but not too heavy. 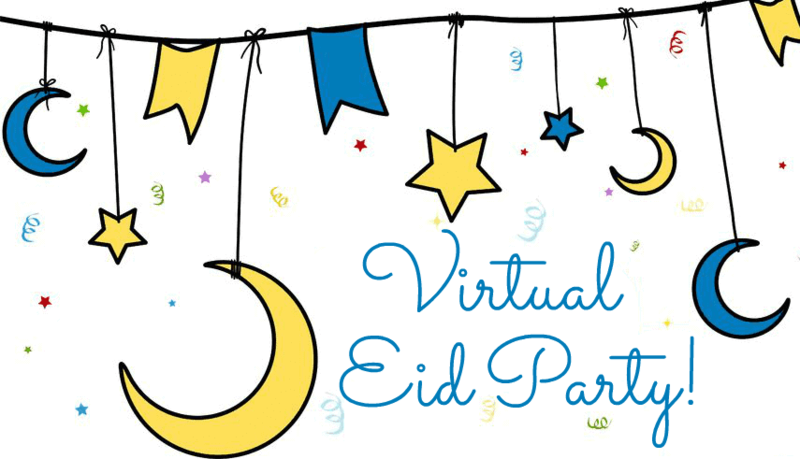 Check out the other posts celebrating Eid with Meriem! I can’t think of a better way to end the month of Ramadan than with some of these awesome recipes. 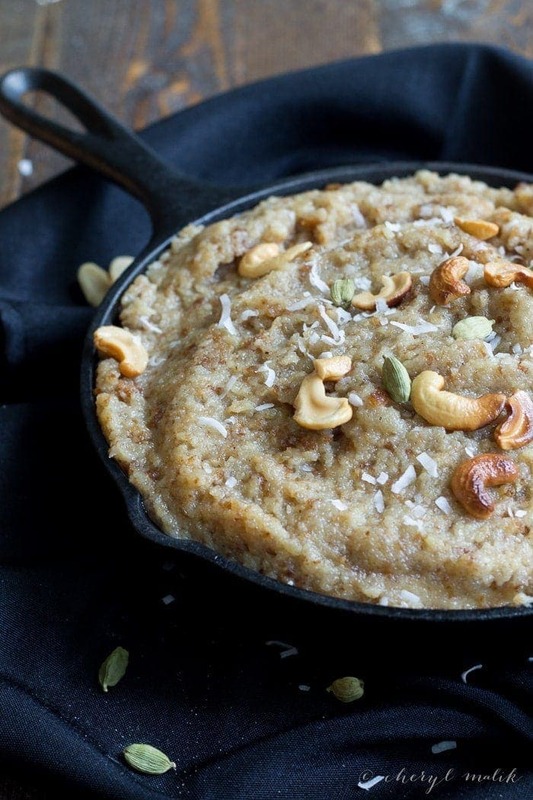 A vegan take on traditional Indian / Pakistani bread halwa. Perfect to celebrate Eid or use up some almost-stale bread. In a medium saucepan, melt the 2 teaspoons coconut oil over medium heat. Sauté the cashews until golden brown. Set aside. Add raisins and sauté until they puff up - do not burn or char, as they will taste bitter. Set aside. Wipe out the saucepan. Heat 1/3 cup coconut oil over medium heat until melted and then sauté bread crumbs on medium-low heat for about 7 - 10 minutes, or until beautifully browned. Spoon out onto a plate to cool. Meanwhile, heat the almond milk and sugar (or agave) in the saucepan and bring to a boil, boiling just long enough to dissolve the sugar. Stir in the breadcrumbs, rose water, and cardamom and reduce heat to low. Cover and let cook about 3 - 5 minutes. Once the breadcrumbs have completely absorbed the almond milk mixture, cook over medium, stirring constantly, until the mixture begins to pull away from the sides of the pan. 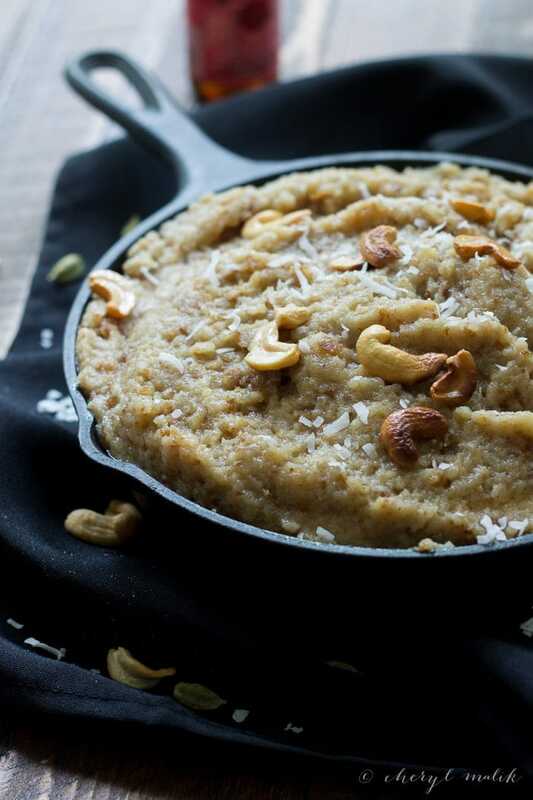 Remove from heat, spoon into a serving bowl, and garnish with cashews, raisins, grated coconut, and cardamom pods. OK so I’m going to be that super-annoying person that asks: Do you think this would still work if I used gluten-free bread instead? Ha! Not annoying at all. I bet it would – I honestly don’t have much experience with gluten-free bread, but it feels like a very forgiving, flexible recipe! LOVE carrot halwa, too – great inspiration for a future post, maybe with agave or something! Consider me intrigued! Going by what you’re saying, I need to try this stat! Thanks so much for participating in my party! Thanks Meriem! And thank you for asking me to participate – what fun! 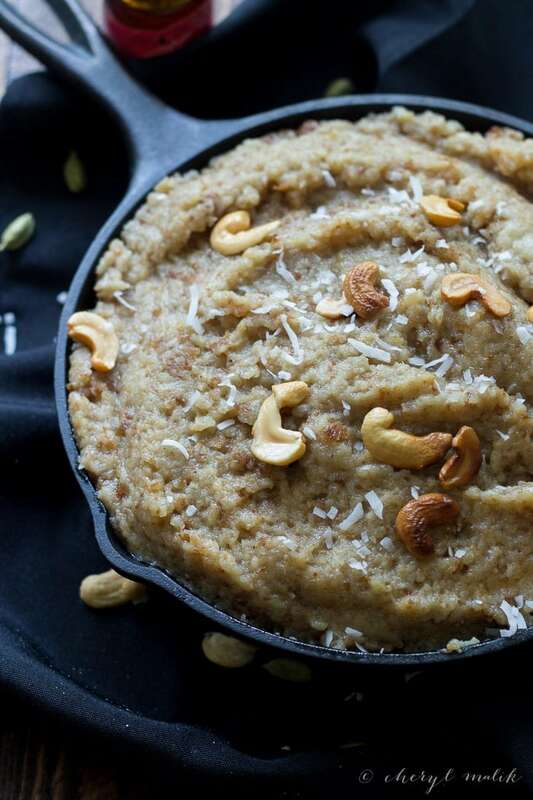 its so hard to find good vegan recipes.. thanks for sharing this delicious halwa. i definitely will be recreating it in my kitchen! Oh this looks delicious! I have everything but the raisins in my kitchen already, I think I’ll try this soon. I’ve only had semolina halwa made with pistachios at one of my favorite middle eastern restaurants, but since I went vegan a few months ago I hadn’t ordered it since because of the dairy. Looking forward to trying this version! Eid Mubarack! Amazing photo’s! Can’t wait to make and try some of this! Cheryl, I love that you lightened up this beautiful bread pudding! What a wonderful dish for Eid (and I bet this would be oh so cozy on a cool autumn night :). This is really beautiful! What a great twist on halawa. Eid Mubarak! Honestly, until now I had never even heard of a halva made from bread, but this looked as good as the one I’m familiar with (we make halva with semolina flour). Snd your photography is amazing, it is spot on since it doesn’t overshadow the dish! Thanks Aiza! We were a bit weirded out by the concept at first, too. But once we tried it we became serious believers. I’ve made almond halwa before to serve with poori, but that’s it. I’d love to try it with semolina!